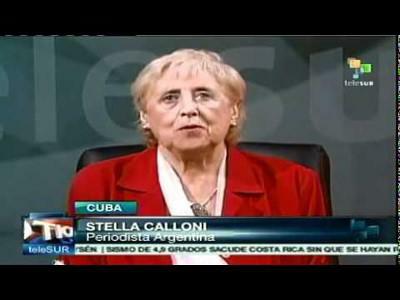 Stella Calloni, a member of the current leadership of the Union of Press Workers of Buenos Aires (UTPBA), is a highly respected correspondent in South America of the Mexican daily La Jornada and director of Challenge Magazine. She is also an author of numerous books including “The years of the Wolf: Operation Condor” (1999) and “Argentina, the crisis of resistance” (2002), among others. Most mass media accuses the Syrian government for the crimes of more than 90 groups that have assassinated opponents. They are based in London or Paris – and pointed to by some observers sent by the United Nations, but none of them consulted the authorities of that country. Nor did they echo of serious complaints registered about the crimes and massacres carried out by mercenaries who are the Special Forces of the great powers seeping across borders with Syria. Cattori, known internationally for her analyses and reports, such as demonstrating that Guantanamo was a sophisticated laboratory of tortures and human experimentation, reports that the French media did a description of a non-existent bombing of Homs. “We did not hear any noise. There was no bombing today (March 23rd). “Everything is calm. I went out to see my friends. Homs is not without communications, all roads are open. We’re safe. The army did not bomb. These are self-styled militias, the “Free Syrian army” who attack the military or police and kill civilians. Even today, a soldier was killed. I know because he lived in my neighborhood,” said an inhabitant of the place. This statement mentions one of the most dramatic subjects because of the amount of people, including families, which the aggressors kidnapped and brought with them. Another report: “The massacre of women and children in the neighborhoods of Al-Karm al-Zeitoun and Adawiyé was committed by them, and then they accuse government forces. There are two tests: the inhabitants of the neighborhoods of Bab Sebaa, Nazihine and Nazha recognized among the victims of this massacre some relatives kidnapped by which the mercenaries had sought ransom for. Regarding these and a number of testimonies and statements, that were given to truly independent researchers and journalists, not the UN or the International Criminal Court said anything about them. “In mid-January, the journalist Dominic Robertson was in Syria and the authorities gave him free access to conflict-affected areas in Damascus and Homs where he was on the day an armed group attacked a delegation of foreign journalists and killed a French reporter, Gilles Jacquier, attached to the intelligence services, and wounded 25 others in the neighborhood Ekrima. He was a direct witness to that crime. A recent report reveals in detail numerous inconsistencies of his statements and character (Dayem) that are manufactured. (Posted on 5/12/11 at Purificación González de la Blanca citing Mamen Garcia Carrión Eye for Peace). DOES THE UN NOT KNOW ABOUT THOSE KIDNAPPED HAVING BEEN KIDNAPPED BY THE INVADERS OF SYRIA? On April 3, 2012, the Berlin magazine Der Spiegel published a report sent by their correspondent in Beirut, Onrika Potts, who interviewed one of the mercenaries who served in Syria with the last name of Hussein, who had fled that country to Tripoli, and whose “work” consisted of “massacring” civilians and military personnel of the Syrian people who had been abducted by armed groups. Hussein acknowledged that “after the first murder he committed with a knife, he began to join the gang called the Funeral, whose mission was named after the action of the gang in charge of interrogation and kidnapping civilians and military and torturing them. He also said that a third gang had the job of burying those killed in mass graves”, something very similar to what they did in Libya. The reporter found that the crimes of armed terrorist groups in Homs are serious human rights abuses carried out by Syrian insurgents “on which no one speaks.” (Sections of the report translated and written by Eba Khattar in the publication Der Spiegel, badly misquoted by some press agencies). The statements and testimonies of the facts regarding the crimes committed by mercenaries and their leaders occupy hundreds of pages, and all journalists have access to them. Therefore the silence of the media makes them complicit in these crimes against humanity. Prensa Latina, 9 June, 2012.